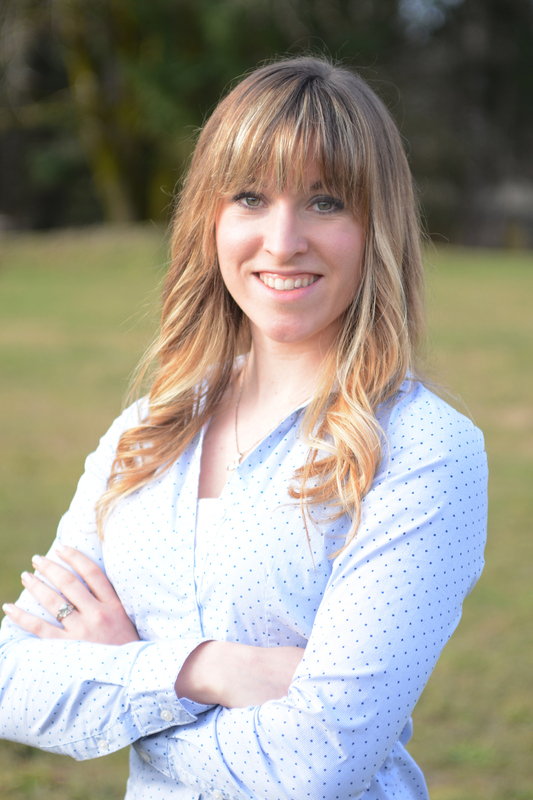 Sorry for the delay in posting – I’ve been experiencing technical difficulties. And by “technical difficulties” I mean that my work tablet took a brief swim and is now resting in a pan of rice. 🙁 Pray for dry insides! You can make a “bad” choice just about everywhere, you can make a “good” choice pretty much anywhere, but you can always make the best choice for where you are. Life happens. Food is a (wonderful!) part of life. By all means, eat out and enjoy it! Making choices when eating out depends a lot on how frequently you eat out. If you mostly cook at home and eat out once or twice a month or only on special occasions, ignore this post. Go out on your date night, anniversary, or family fun night and enjoy it. Don’t worry about this – it’s not a big enough portion of your whole eating picture to matter that much. I’m not advocating an all-out binge, but you should order what you want and move on. We’ve eaten Asian food out twice since I started anti-inflammatory. Once we went to a new (to us) local Asian fusion restaurant that essentially offers a Subway-style, build-your-own sushi wrap, bowl, or salad. When eating out along these lines, choose foods without too much carbohydrate and get lots of veggies. Choose fish (especially salmon) – it’s high in anti-inflammatory omega-3s! If you’re up for spicy, add in brightly-colored spicy sauces, but go easy on those with sugar like teriyaki or sweet chili sauce. The seaweed in sushi is loaded with antioxidants too. 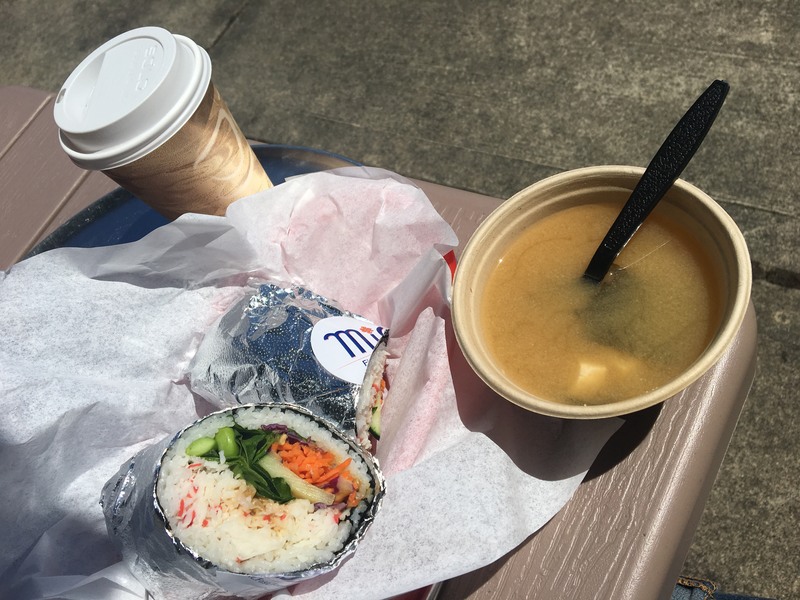 I really wanted a sushi wrap so I asked for a light layer of rice, got miso soup on the side, and only ate half of the wrap. Another day we went to a Korean restaurant. 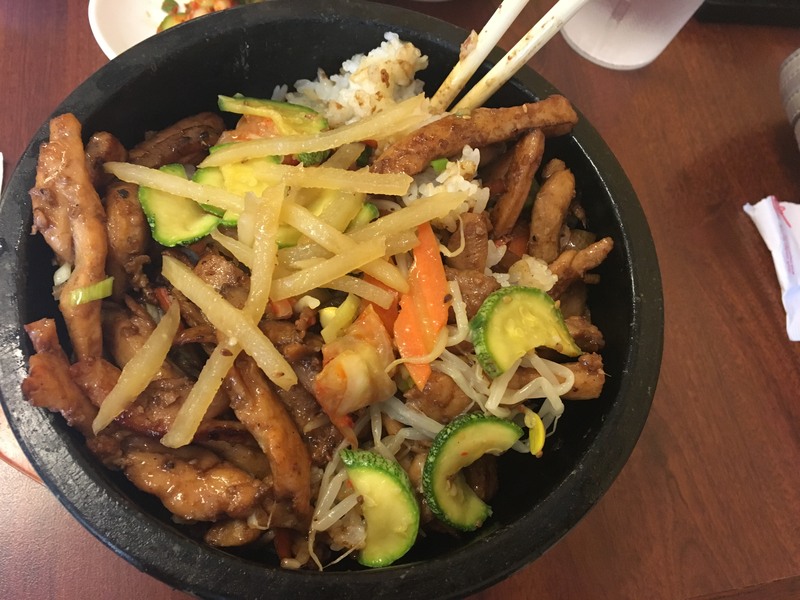 This one was easy – I love bibimbap! If you aren’t familiar, it’s a crackly, delicious cauldron of rice, tons of veggies, a meat of your choice, and an egg. I chose chicken and added loads of the optional veggie add-ins at the table (especially kimchi, which not only has colorful spices but also contains probiotics). Again, I saved half for later. 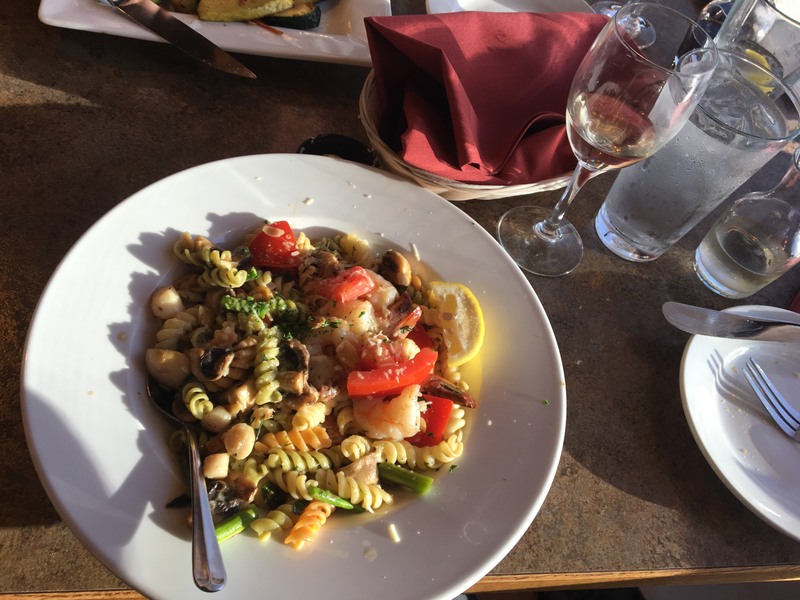 This one was tricky because (by far) my favorite type of Italian food is pasta, and most pasta dishes are just that – a giant plate of carbohydrates with a creamy, buttery inflammatory sauce. Hmph. I had to do a little finagling for this one. I decided I would still get pasta but choose a lean meat, an olive-oil based vinaigrette sauce, and lots of colorful vegetables. In this case, I picked a seafood pasta (to up the omega-3s) with tomatoes, onions, and asparagus. To prevent eating too many carbs I only ate half (are you noticing a pattern?). A vegetable-based sauce (like marinara) would have worked nicely too. Watch out for too much cheese or the absurd amount of delicious carbohydrates like breadsticks with pasta, pasta, and more pasta! If you weren’t so much a pasta person, a salad with Italian vinaigrette or a chicken breast with marinara sauce could be a less inflammatory choice. A friend’s birthday dinner took us to a seafood restaurant. Seafood is anti-inflammatory as long as it’s not covered in butter or alfredo sauce (darn it), so you can choose a fillet of salmon or whitefish with veggies and a starch any time. 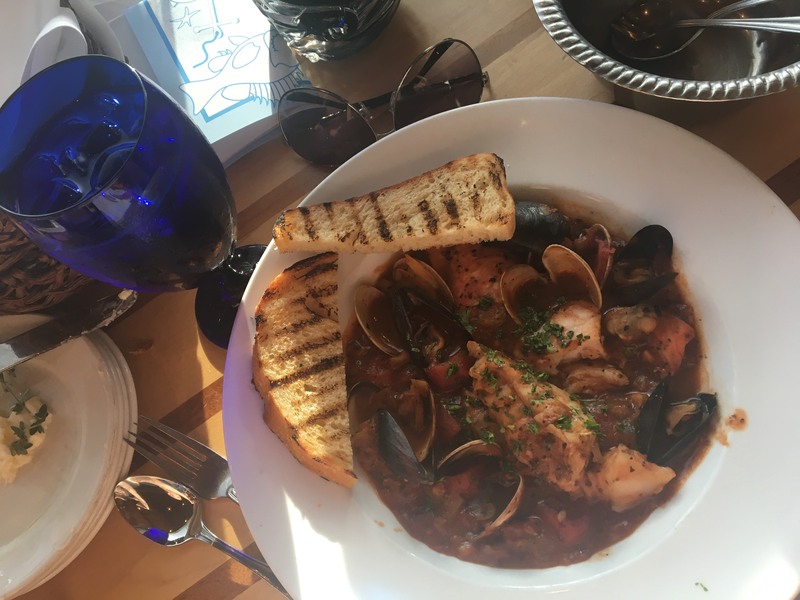 I opted for a cioppino – basically seafood stewed in a tomato-based sauce with herbs and spices. High in antioxidants and omega-3s! It came with one slice of bread (plus in the spirit of full disclosure, I ate a slice of sourdough as an appetizer too). I skipped a drink and opted for water instead. Since my entree wasn’t inflammatory and it was delicious and reasonably portioned, I ate the whole thing! We didn’t actually go out to an Indian restaurant in the last three weeks, but it could be a great place to go for an anti-inflammatory meal because of all of the beautiful spices they use! Keep your rice/naan portion reasonable, choose a sauce that is brightly-colored but not creamy, like curry, and get a brightly-colored veggie for a side (like palak paneer). This is a great opportunity to go meatless and choose a lentil- or garbanzo-based dish as well!